“Surescripts is proud that our truly collaborative efforts with software technology providers are producing continuous quality improvements in e-prescribing and electronic information exchange. It is an honor to work closely with healthcare software professionals who are committed to implementing our proven e-prescribing best practices and who worked hard to earn the White Coat of Quality distinction,” said Ajit Dhavle, Pharm.D., Director of Clinical Quality of Surescripts. Surescripts’ industry-leading Quality Management Framework focuses implementing proven clinical quality guidelines and best practices that help EHR software providers deliver continuous improvements to workflow to help prescribers and pharmacists realize the full benefits of e-prescribing and electronic information exchange. 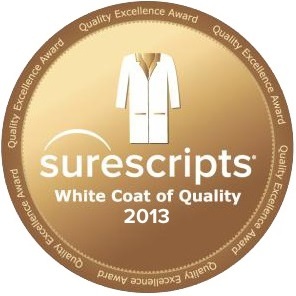 Surescripts’ White Coat of Quality award recognizes software providers that have achieved quality criteria and implemented software improvements. This unique collaboration between Surescripts, EHR vendors, pharmacies and PBMs is measurably improving the e-prescribing process. For more information, contact the Surescripts Quality Office at quality@surescripts.com.